‘Tis the Season for Thanks and Turkey! Thanksgiving is all about family, giving thanks, and of course, turkey so head to the library this week to check out these books. I know an old lady who swallowed a pie, a Thanksgiving pie, which was really too dry. And with that the feast begins! After the pie the old lady swallows a whole squash, all of the salad, and the entire turkey! As Mother and Father watch in shock, the two children are delighted to see the old lady growing fatter and fatter. And, in the end, the old lady makes a surprising and humorous contribution to the holiday festivities. No one wants to take home the Ugly Pumpkin. Sure, he doesn’t look like any of the other pumpkins, but why does everyone have to tease him so much? The poor, lonely pumpkin goes in search of a place where he’ll fit in—and finally discovers the truth about who he is and where he belongs. When was the first Thanksgiving? How do we celebrate today? Learn all about this holiday’s symbols and traditions with this fun and easy-to-read book. Enjoy a hands-on activity making a thank-you for a community helper, too! Percy Isaac Gifford explains the rules for getting the most out of the Thanksgiving holiday. Percy leaves readers with the true recipe for a perfect Thanksgiving: a large helping of gratitude and thankfulness. Turkey is in trouble. Bad trouble. The kind of trouble where it’s almost Thanksgiving . . . and you’re the main course. But Turkey has an idea–what if he doesn’t look like a turkey? What if he looks like another animal instead? After many hilarious attempts, Turkey comes up with the perfect disguise to make this Thanksgiving the best ever! Wendi Silvano’s comical story is perfectly matched by Lee Harper’s watercolors. If you’re looking for a fun task for kids to do on Thanksgiving how about making some turkey cone hats? Directions provided by Crafty Morning. Fall is almost over, so why not spend these last few days of crisp weather and beautiful leafy colors outside by taking a walk? Squirrels, rabbits, and other little critters will soon be seeking their burrows for winter. On your hike, see if you can spot them collecting nuts and savoring the last leafy greens. These titles capture the colorful, active joy of fall. Gianna Z. has less than one week to collect twenty-five leaves for a science project, or else she might lose her spot at cross-country sectionals. Finishing her project will be enough of a hurdle, but with a grandmother who keeps losing her teeth, a father who drives her to school in the family hearse, and an arch-nemesis intent on stealing her spot on the team, Gianna will need a stroke of brilliance to make everything fall into place. The official start of the harvest season, it occurs around September 21 each year. It marks the end of summer and the beginning of longer nights and shorter days. For many cultures around the world, the fall equinox represents a time to celebrate the harvest and begin collecting and storing crops. Looking at both the science of weather and the history of how the fall equinox has been celebrated by various cultures throughout the world, this book will inspire a new understanding of autumn and the harvest season. On your hike, be sure to collect interesting and colorful leaves. 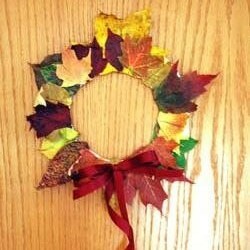 When you get home, you can use these to make a beautiful autumn decoration for your home! The guide can be found at Crafts-for-All-Seasons. 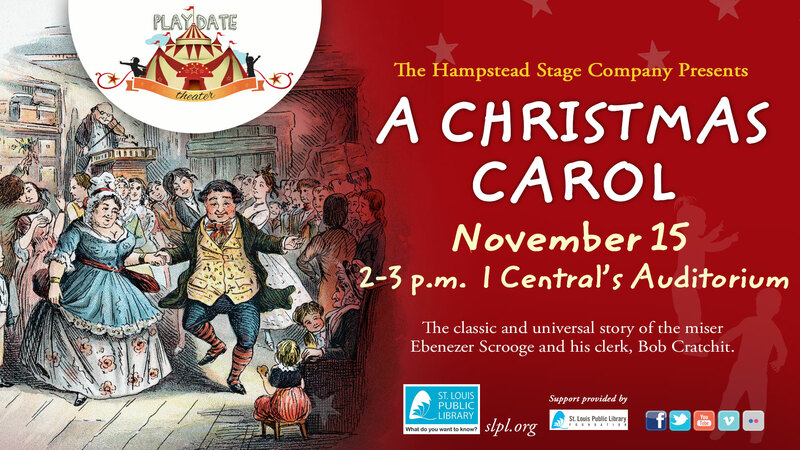 Play Date Theater welcomes A Christmas Carol presented by Hampstead Stage Company! Against the background of Victorian England, the spirits of the season teach Ebenezer Scrooge the true meaning of Christmas. Charles Dickens’ timeless universal tale of the miser, Scrooge, and his clerk, Bob Cratchit is performed by two actors in full period costume, each playing several roles. Audience volunteers will be enlisted to play supporting characters. The play last 50 minutes. A question and answer session is included. Parents may want to prepare their children for the play. Use the Hampstead Stage Study Guide for activities, plot summary, character and scene lists, and more. When: Saturday November 15 at 2 p.m.
Tuesday, November 11, 2014, is Veterans Day. All SLPL locations will be closed in observance of the holiday. Honor our veterans by reading these insightful books, giving back and listening to their stories, and showing heart. This book introduces readers to what it means to celebrate Veterans Day, and shows them why this holiday is so special. Veterans Day is a time to honor the soldiers who have fought for the United States in war. From the first celebration after World War I to celebrations across the country today, Veterans Day provides an in-depth and informative overview of the holiday. Veterans Day has easy-to-read text that is supplemented by beautiful photos, maps, and sidebars. This title also features a hands-on activity and a recipe for a dish commonly enjoyed during the holiday. Veterans Day is a time to honor the men and women who have served in the United States Armed Forces. Young readers will learn about the soldiers this holiday celebrates and how the occasion is marked across the country on November 11th. This history of Veterans Day includes a timeline and glossary, and reflections by all types of veterans. One benefit of living in the United States of America is the ability people have to impact their local, state and national governments. These fun books can get kids excited about the power of elections. Where are the girls? When Grace’s teacher reveals that the United States has never had a female president, Grace decides to be the first. And she immediately starts off her political career as a candidate the school’s mock election. But soon, she realizes that she has entered a tough race. Her popular opponent claims to be the best man for the job–and seems to have captured all the male votes–while Grace concentrates on being the best person. In this timely story, author Kelly DiPucchio not only gives readers a fun introduction to the American electoral system, but also teaches them the value of hard work, courage, and independent thought–and offers an inspiring example of how to choose our leaders. “I could do that,” says six-year-old Esther as she watches her mother making tea. Start her own business at the age of nineteen? Why, she could do that, too. But one thing Esther and other women could NOT do was vote. Only men could do that. With lively text and humorous illustrations as full of spirit as Esther herself, this striking picture book biography shows how one girl’s gumption propels her through a life filled with challenges until, in 1869, she wins the vote for women in Wyoming Territory – the first time ever in the United States! Using a town’s mayoral election as a model, this lively introduction to voting covers every step in the process, from the start of the campaign all the way to the voting booth. There’s even a recount! The cast of characters includes two dogs (and a cat), whose questions and comments mirror those of young readers and help to explain some of an election’s more confusing aspects. Told with clarity and wit in Eileen Christelow’s signature comic-book style and vetted by an expert in voter education, this look at how we choose our leaders turns an often daunting topic into an exciting narrative. Who would have guessed that learning about voting could be so much fun? A timeline of the history of voting in the United States, a glossary of words associated with voting, a discussion of American political parties, and a list of Internet resources are included. 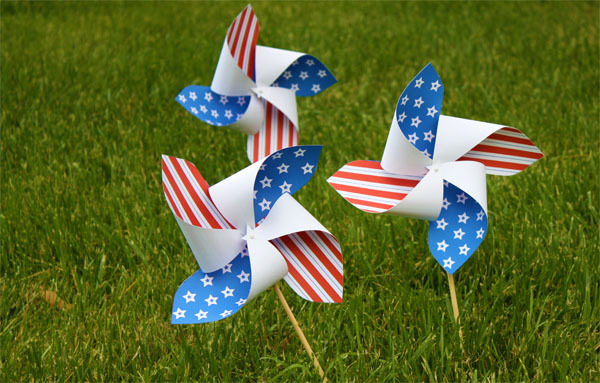 After celebrating your freedom to read with these titles, try this fun and patriotic pinwheel craft. Directions can be found at alphamom.com.